Nearly 210 Lycoming College volunteers participated in National Volunteer Week by helping homeowners in Williamsport and surrounding areas tackle year work. The students also assisted the City of Williamsport in cleaning up public spaces, such as Brandon Park, The Riverwalk, and Downtown Williamsport. The College visited 38 locations in total. Lycoming College’s Clean Water Institute (CWI) scored a victory this week with its beloved Eastern hellbender, voted Pennsylvania’s official amphibian by the state’s House. Championed by Sen. Gene Yaw ’70 (R-23), the bill is expected to be signed by Gov. Tom Wolf on Tuesday. The news has sparked broad media coverage in outlets including ABC News and The Washington Post, among others. From March 6-10, Lycoming College students attended the SPE Conference (Society for Photographic Education) in Cleveland, Ohio. They were able to attend many lectures by leading educators in the field of photography, as well as to network with graduate chairs and other photographic professors from universities from across the United States. A group of Lycoming College students took part in the 90th meeting of the Eastern Psychological Association in New York City, February 28-March 2. They gathered their findings and prepared posters to present to their peers around the theme of the conference: Psychology and Constructive Change. 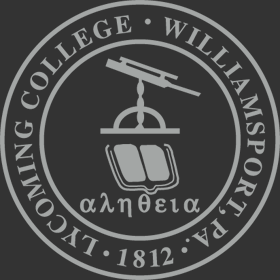 The Williamsport City Jazz Orchestra will once again share the stage with the Lycoming College Jazz Ensemble for an evening of music at the Community Arts Center on Friday, April 26, 7 p.m.
As a college president, I am deeply concerned when I read that the level of public trust in higher education has declined. An October 2018 Gallup poll, for example, found that public confidence in higher education had fallen from 57 percent in 2015 to 48 percent in 2018, with the largest decline occurring among Republicans (56 percent to 39 percent). I am also worried that the recent college admissions scandal will erode further public confidence in higher education. In this month’s letter, I begin by sharing some thoughts about this troubling episode and what we can learn from it. Pi Day - March 14, Curtin Intermediate and Lycoming Valley Intermediate students celebrated in the best possible way: with science. The local students, in grades 4 through 6, partnered with science professors at Lycoming College for a day of science exploration and review. College can be a daunting prospect to most high school students. There are so many unknowns, from where their classes will be, to what their new professors are going to expect of them. Come Feel the Blues as the Larry Fuller Trio Perform at Lycoming College! "He sprinkles stardust on whatever song he plays; you hold your breath in wonder." Lycoming College Theatre Department will close out its 50th anniversary season with one of Jean-Baptiste Molière’s greatest comedies: “The School for Wives” translated into English verse by Richard Wilbur. Directed by Theatre Department Chair and Associate Professor Biliana Stoytcheva-Horissian, the play will be performed in room D-001 of Wendle Hall, adjacent to the lobby of the Mary L. Welch Theatre, 8 p.m., April 10-13.